Making corrections of the same type to multiple keywords: replace a keyword or negative keyword (for example, to correct reproduced typo), set new bids. 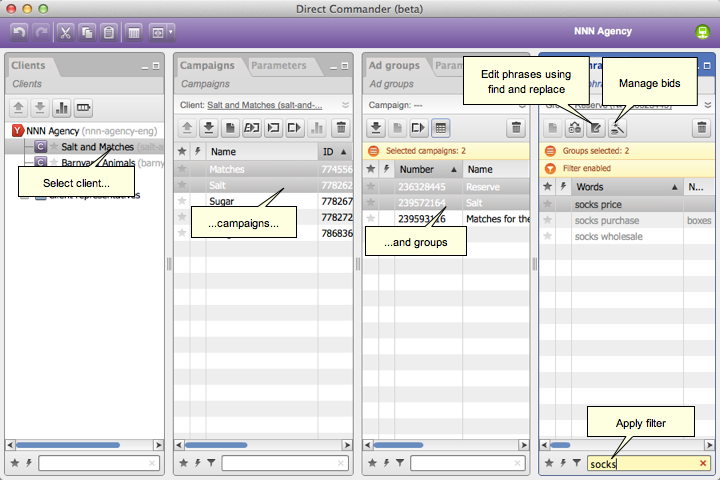 Select the necessary campaigns in the Campaigns tab. Select the groups you need in the Ad groups tab. If only some keywords should be changed, change them in the Phrases tab or apply the filter. Use Search and Replace, Split Keywords by Word, Change Case and Delete Duplicates and Fix Overlaps.